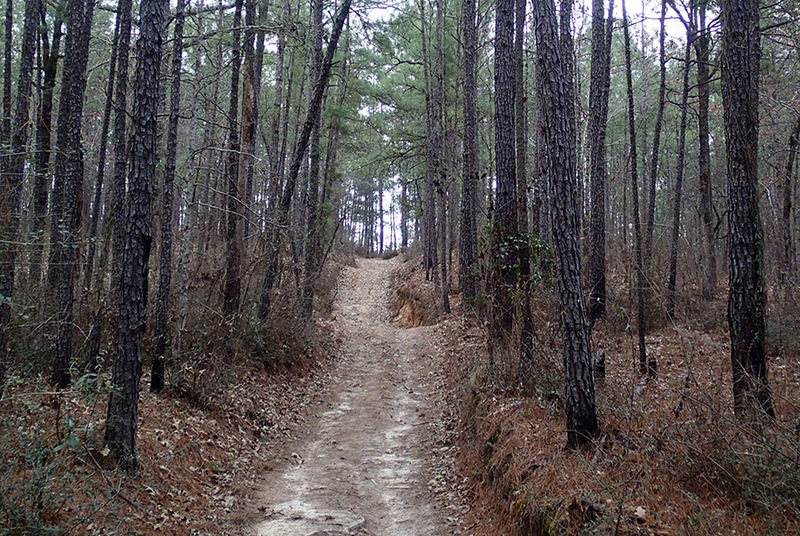 This run is in the Kisatchie National Forest, south of Shreveport and just off I-49. I had a good time at this race despite the weather. The course is a rolling 31 mile loop through a Southern Pine forest. When dry it is very runnable. The trail is broad enough to run with a partner. You could get over all the water crossings on the first loop with dry feet. After the heavy rain, there were quite a few crossings and it was thigh deep at Spa 21. Counting the Start-Finish there were five aid stations per loop. They had everything you'd need. Warning, don't try to eat every kind of soup at each station during the dark loop. I think that was cause of my stomach upset. I heard the portapotty at AS #3 was the best ever. There was a chandelier. The organization was good, the volunteers very friendly and I'd go back. There is a topo map with the course and aid stations from 2018. I took my GPS on the first loop to capture the course and the 100 miler out and back. These are my photos. They are free for non-commercial use. I've already given them to Edie if the race wants to use them. There are a lot of photos here, >500 the last I looked.